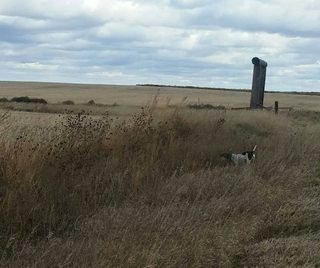 Made the trip out to North Dakota for 6 days of hunting with my duck hunting buddy and his yellow lab, as well as my shorthair, Rowdy. 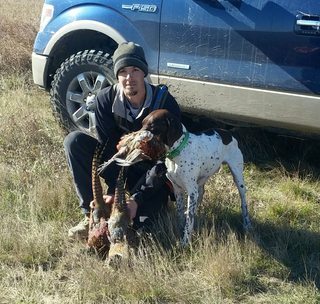 We hunted both dogs together all 6 days at the same time. 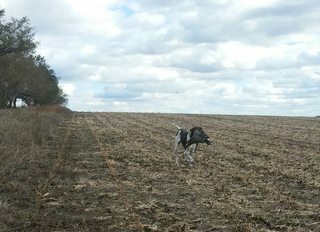 We had zero issues with the lab pup wanting to range out with Rowdy, nor did the lab cause Rowdy to break point, even though I had to remind Rowdy with a "whoa" one of two times the lab flushed a bird over his point. We struggled hard to find birds the first two days of the trip. 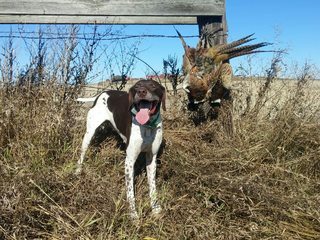 Rowdy had put in 44 miles after two days of hunting and we had seen 1 rooster and 2 hens, as well as 1 sharptail, which my buddy shot. We tried two different areas the first two days and on the third day we tried yet another completely new area. We walked some incredible pheasant cover on the third day and put up 3 dozen pheasant, 3 coveys of huns and 15 sharptails. Windy as all hell which made for some tough shooting and jumpy birds, but I ended up with 2 roosters and 2 sharptail and my buddy shot 2 roosters. Rowdy logged 29 miles on the Garmin that day. The 4th day we tried different properties and chunks of state land in that general area and again found more birds, this time putting up 10 or 12 pheasant and 5 sharptails. I ended up limiting out on roosters over Rowdy points and whiffing the easiest dinner shot on a covey of sharptails I've ever had. 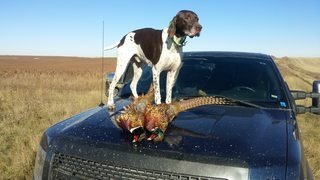 My buddy ended up shooting 2 roosters as well that day and Rowdy put in 15 miles. The 5th day the temps hit 70 degrees and we drove around to small sections and did 3 small hunts for roosters. 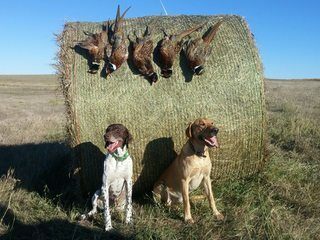 Two of the sections were unproductive but the 2nd one we tried held a nice mature rooster, which both dogs were tracking, when it hit the end of the tree row where it met a fence and wild flushed. I knocked it down dead on the second shot and Rowdy got the retrieve through the fence. We then drove an hour to a completely different area to try our luck there for our last day and on our way home. On the 6th day we knew we had to make the drive back home so we only hunted 3 hours in the morning but man was it productive. We put up 12 to 15 pheasant and a covey of huns as well. I limited on roosters, while my buddy got a rooster and a hun. He said it was the first hun he had shot in 40 years. All in all it was a much needed vacation during our busiest time of year at work. Nothing like emptying your mind and following your dog on the prairie. Rowdy, if you don't mind me asking what happened to your young DK? He died of bloat in May of 2017. Great Trip, Thanks for taking us along. Looks like the birds eventually cooperated. Great you could find 'em. Huns aren't very common where I've hunted. Think they're more toward the east? Not many Sharptails either, too far south or something? Shot one or two one day and that was it. Thanks. Enjoying the out of state trips I've taken so far this year, the birds we've encountered, as well as the people. I especially love traveling east and south. Great post glad to see someone is getting it done. Nice to see birds that do not fly in the skies around here. Thank you for the post. If I read it correctly, you shot a couple of more birds with you pointer versus your friends lab. Very few issue with the lab and pointer. So it seems to me , you have validated what i have been saying for years. 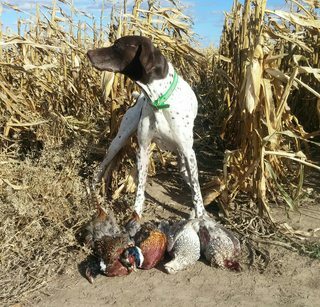 You dont really need to have a pointer to have success with upland birds? I have no doubt that your dog ran many more miles than the lab, yet amazingly, it produced very few more birds????? So really what we are left with is this. 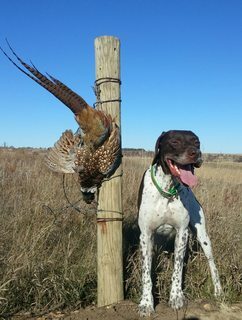 You dont need to have a pointer to hunt upland birds. Not readily apparent in the post is quality of breeding and training. 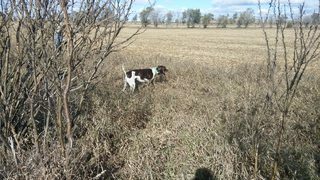 There were no complaints of obedience with either dog other than the pointer breaking when the lab flushed. That takes some effort to control, so no real fault there. I think this justifies my position that no matter the breed , its up to us to make the best of the dog. I hate to ask but, was there a cause of the bloat with your dog that we may learn from? Very sorry to hear! Wow, you really used a lot of science based research to come up with that conclusion Kiger. Was it peered reviewed too? Shouldn’t really matter which dogs produce the most. I’m sure head to head some pointers are better than flushers and in other situations some flushers might be better. Maybe a mutt from the pound will out produce your flusher. Who cares, just get whatever breed or mutt that you want and go hunt! To each their own. Damn man, looks like a great week! Awesome photos and glad the pieces fell together as the week went on. Keep up the good work! I hate to see you wasted a paragraph or two Kiger, but like I've said before. I see a post you write and I immediately stop reading and skip to the next. Have a great day, Kiger. Nice jobs guys. Thanks for taking the time to write it up and post photos. Keep it up!